If you have any questions about camp opportunities, please contact . Fun and educational sessions that combine skill development with game play. The practice and play session includes 20-25 minutes of warm up, skill development and pre-game instruction. The remainder of the session is dedicated to instructional game time. Players will be divided into developmentally appropriate groups and the Academy staff will facilitate skills/games. Parent Coaches needed to assist with game time. Please note if you can help during registration. The training will be run by Kevin Wexler, who leads player development for PLL. The sessions are applicable to players of all skill levels and are designed to be fun. Coach Wexler brings over 18 years of coaching, teaching, and playing experience to Pittsford Little League. Kevin teaches Physical Education and Adapted Physical Education in the Greece Central School District and had been a part of Little League for 8 years. Additionally, he played catcher for SUNY Brockport and the Newark Bardge Bandits, an independent professional baseball team. The Rochester Sports Garden is offering baseball camps for players over February break (ages 6-12) with a great focus on fundamentals, and an excellent coach-to-camper ratio. Jim Capellupo, Pittsford Sutherland Varsity Head Baseball Coach, is the lead instructor at the camps and will be assisted by the Sutherland coaching staff as well as former varsity players who currently play in college. The Rochester Sports Garden handles all registration. Please click here to download their camp form and their waiver to send in. Run by the Sutherland Varsity Baseball Coach Jim Capellupo and Sutherland players. 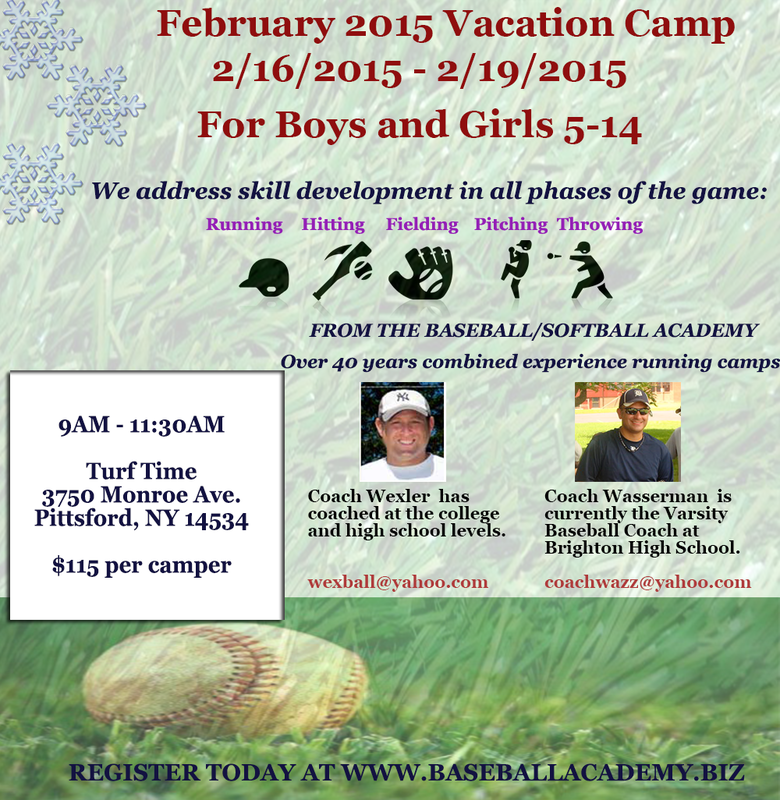 Jason Wasserman and Kevin Wexler of The Baseball and Softball Academy will be offering a camp for boys and girls ages 5-14 during February Break, 2/16 - 2/19 (Mon - Thurs), 9-11:30am. The camp will be held at Turf Time, 3750 Monroe Ave. 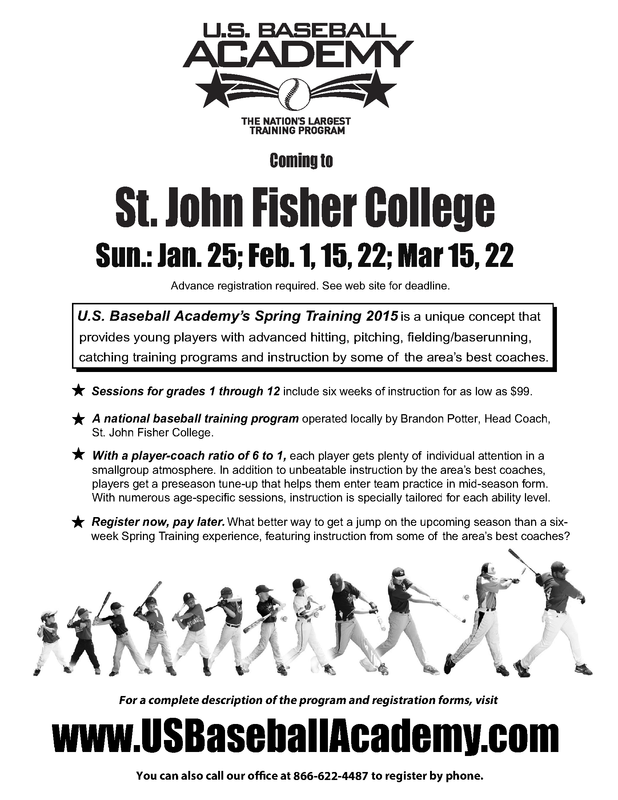 Please see The Baseball and Softball Academy web site for more information and to register online.